When hundreds of photos of “Teachers say Let them Stay” actions at schools poured through social media in February, everyone fighting for justice for refugees stood taller and felt bolder. Teachers have a stake in closing the camps. Many of us have students or colleagues who are suffering directly from the policies, or from the racism that underpins them. When we watch videos of the kids on Nauru it’s obvious to us they need a place in our schools, and their parents deserve safety and support. We teach critical thinking and respect, but all our students are growing up in a political environment drenched with anti-refugee lies and demonisation. And the cost of running the offshore prisons could pay for half of the $4.5 billion the Turnbull government won’t spend on the last two years of Gonski. Despite decades of teacher bashing from politicians and the media, polling shows the community has enormous respect for teachers. When we speak, people listen. So we have a responsibility to speak up. Disgust about government refugee policy has percolated in school staffrooms for years. We have found small ways to show refugees solidarity, from passing around teaching resources that humanise asylum seekers, to tracking down study options for students on temporary visas. But codes of conduct have made it challenging for teachers to take open, political positions. Politicians use schools and teachers to further their political positions all the time, like attacking Safe Schools or the Islamophobic anti-radicalisation kits. But we are not supposed to speak up about anything in our capacity as teachers, even though we see the impact of these policies up close. 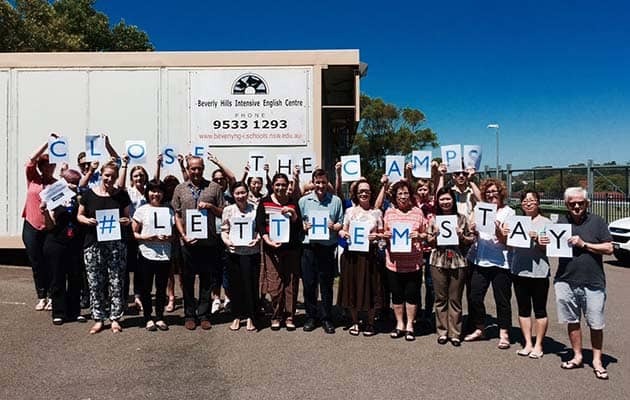 When doctors and hospital workers refused to release children back into detention, and Brisbane teachers struck over the detention of a year 12 student, we found the courage to follow their example. The actions required someone at every school to take a lead. Some teachers put the call out for action via the union email list. Others used word of mouth, or put a note in staff pigeon holes. Others put up sign on sheets, or were able to make announcements at staff meetings. Sharing articles about the abuse in schools on Nauru, the UN allegations of torture, and the principal from Glenroy Secondary speaking out against having his students sent back to Nauru helped make the case for action. At some schools, a few individuals or small groups took “selfies” with signs to start the ball rolling, and then others felt more confident to get involved. Once a few schools had taken action, it became easier—we were part of something really broad. “I felt so relieved and proud to see a huge group of my colleagues waiting for me to take the photo. It opened up conversations and there was a sense of unity”, one teacher reported. A few principals supported the action by participating themselves, or covering the event in the school newsletter. Others gave tacit support by stepping out of the way. But some, scared that “their” school would face a backlash from the community or media, reprimanded staff for using the school’s name, department email, or department paper. They waved the code of conduct at teachers to try to intimidate us from taking a stand. The actions happened anyway, despite the intimidation. We now know that hundreds of other teachers, and our unions, as well as health, community and social workers support us. Even State Premiers are falling in step with the pro-refugee momentum. Following the photo actions, Teachers for Refugees have held meetings in Sydney and Melbourne to debrief and hear first-hand from people who taught refugee children on Nauru. We have organised Teachers for Refugees contingents for the Palm Sunday rallies, and for refugees to speak at union and staff meetings. But the government is still intent on sending the 267 refugees back to Nauru and Manus, and both major parties remain committed to offshore detention. Public opinion has shifted, but it needs to shift further to create decisive pressure on the politicians. Replicating the teacher selfie actions amongst other groups of workers is one way to deepen support for the campaign. Union bans on work involved in detaining and deporting refugees would make offshore detention practically and politically impossible. This underlines the importance of organising at work. The action by doctors and nurses at Lady Cilento hospital in Brisbane drew massive public support. All workers refusing to co-operate with refugee detention need to feel confident that they too would have support if they implemented bans. The more workers take up the fight for refugees, the greater chance we have of dismantling the detention regimes for good.